ARLINGTON, Va., June 22, 2017 /PRNewswire-USNewswire/ -- Legalizing recreational marijuana use in Colorado, Oregon and Washington has resulted in collision claim frequencies that are about 3 percent higher overall than would have been expected without legalization, a new Highway Loss Data Institute (HLDI) analysis shows. This is HLDI's first report on how marijuana legalization since 2014 has affected crashes reported to insurers. 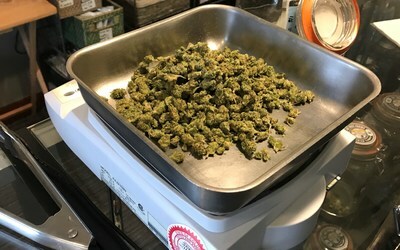 Marijuana is weighed at a dispensary in Crested Butte, Colorado. The Rocky Mountain state was the first to begin retail sales of recreational marijuana in January, 2014. More drivers admit to using marijuana, and it is showing up more frequently among people involved in crashes. Though there is evidence from simulator and on-road studies that marijuana can degrade some aspects of driving performance, researchers haven't been able to definitively connect marijuana use with more frequent real-world crashes. Some studies have found that using the drug could more than double crash risk, while others, including a large-scale federal case-control study, have failed to find a link between marijuana use and crashes. Studies on the effects of legalizing marijuana for medical use also have been inconclusive. Colorado and Washington were the first states to legalize recreational marijuana for adults age 21 and older with voter approval in November 2012. Retail sales began in January 2014 in Colorado and in July 2014 in Washington. Oregon voters approved legalized recreational marijuana in November 2014, and sales started in October 2015. HLDI conducted a combined analysis using neighboring states as additional controls to examine the collision claims experience of Colorado, Oregon and Washington before and after law changes. Control states included Idaho, Montana, Nevada, Utah and Wyoming, plus Colorado, Oregon and Washington prior to legalization of recreational use. During the study period, Nevada and Montana permitted medical use of marijuana, Wyoming and Utah allowed only limited use for medical purposes, and Idaho didn't permit any use. Oregon and Washington authorized medical marijuana use in 1998, and Colorado authorized it in 2000. HLDI also looked at loss results for each state individually compared with loss results for adjacent states without legalized recreational marijuana use prior to November 2016. Data spanned collision claims filed between January 2012 and October 2016 for 1981 to 2017 model vehicles. Analysts controlled for differences in the rated driver population, insured vehicle fleet, the mix of urban versus rural exposure, unemployment, weather and seasonality. Collision claims are the most frequent kind of claims insurers receive. Collision coverage insures against physical damage to a driver's vehicle in a crash with an object or other vehicle, generally when the driver is at fault. Collision claim frequency is the number of collision claims divided by the number of insured vehicle years (one vehicle insured for one year or two vehicles insured for six months each). "The combined-state analysis shows that the first three states to legalize recreational marijuana have experienced more crashes," says Matt Moore, senior vice president of HLDI. "The individual state analyses suggest that the size of the effect varies by state." Colorado saw the biggest estimated increase in claim frequency compared with its control states. 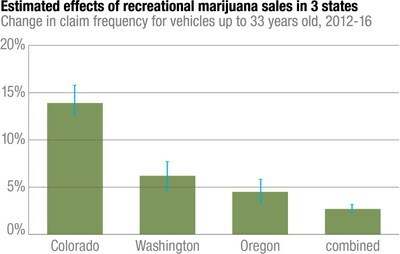 After retail marijuana sales began in Colorado, the increase in collision claim frequency was 14 percent higher than in nearby Nebraska, Utah and Wyoming. Washington's estimated increase in claim frequency was 6 percent higher than in Montana and Idaho, and Oregon's estimated increase in claim frequency was 4 percent higher than in Idaho, Montana and Nevada. "The combined effect for the three states was smaller but still significant at 3 percent," Moore says. "The combined analysis uses a bigger control group and is a good representation of the effect of marijuana legalization overall. The single-state analyses show how the effect differs by state." Each of the individual state analyses also showed that the estimated effect of legalizing recreational use of marijuana varies depending on the comparison state examined. For example, results for Colorado vary from a 3 percent increase in claim frequency when compared with Wyoming to a 21 percent increase when compared with Utah. HLDI's new analysis of real-world crashes provides one look at the emerging picture of what marijuana's legalization will mean for highway safety as more states decriminalize its use. In the coming years, more research from HLDI and others will help sharpen the focus. As HLDI continues to examine insurance claims in states that allow recreational use of marijuana, IIHS has begun a large-scale case-control study in Oregon to assess how legalized marijuana use may be changing the risk of crashes with injuries. Preliminary results are expected in 2020. In addition to Colorado, Oregon and Washington, five other states and Washington, D.C., have legalized marijuana for all uses, and 21 states have comprehensive medical marijuana programs as of June. An additional 17 states permit limited access for medical use. Marijuana is still an illegal controlled substance under federal law. "Worry that legalized marijuana is increasing crash rates isn't misplaced," says David Zuby, executive vice president and chief research officer of the Insurance Institute for Highway Safety. "HLDI's findings on the early experience of Colorado, Oregon and Washington should give other states eyeing legalization pause."